As many of you know, this past January I I left my sales director job in the Halloween Industry and called it quits on corporate life. I had no idea what I was going to do with my life but was hoping that I would have an epiphany sooner rather than later. My last month on the job I went to the Halloween show in New Orleans. I saw a bunch of old co-workers and one of them immediately said to me, “you should start a blog!”. This was not the first time someone had told me to do this. My mother and a old co-worker had both been telling me for years! Something in that moment clicked. Two weeks after the New Orleans show I went to a business conference and one of the women I was staying with was also a blogger. We started chatting and it solidified the idea. Two weeks later my husband had my website semi up and running and it was official! I was a blogger! Flash forward 5 months and I am forging full steam ahead without a clue as to what I am doing. I am making pennies at this point and it takes up a lot of time. I didn’t realize how much time and effort goes into writing a blog. Between the website, 20 social media platforms, algorithms, artwork, optimizing, writing, videoing, I am BUSY. That being said, I am enjoying it because it is for me. It is my business and I get to make the rules. The daily thoughts that run through my head are endless. Some days I am so confident that if everyone else can do this, I can too. Then the next day I am like, “who am I?”, “why would people want to listen to me?”. The mind is a powerful thing and can be so uplifting and debilitating at the same time. People have asked if I am blogging full time. I am not. At this point, I cannot because it is not paying me (yet). It is hard to focus on something 100% when it isn’t the thing that pays you. However, if I don’t focus on it 100%, it will probably never pay me. This blogging shtick is a full fledged business and needs to be managed as such. I haven’t had the time to really plan my content out, instead I am going by the seat of my pants, week by week and cramming everything in. I need to start working smarter not harder. Problem is I don’t know how to do that! Mentors, where you at? There are so many people out there crushing it in the blogging world. There are multiple ways to make money (although I have yet to do so) in the blogging industry. Ads are one way. Google and YouTube can put ads on your site/page and basically you get paid when traffic comes to your site and sees those ads (even if they don’t click on them!). Sponsored posts are another way. So for example, for someone like me, it would make sense if I was sponsored by a cookware company or olive oil or Under Armour. They basically would pay me to promote their product to my following. (people follow me! links below LOL). Free goods or services is another way. So companies would send you their products free for you to review on your site/social media. Hell, you might even get free vacations and in return you have to write/review the trip. I am going to keep hustling and putting up content that I think people want to see and that I am passionate about. 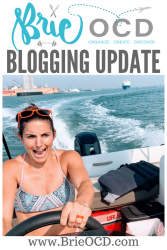 I am committed to seeing where this blogging business takes me and I know that I can do this! I have to stay true to myself, blog about what I love and hope that people will appreciate me! Thank you for your continued support! I appreciate it!! You guys want to hang out and drinks some white wines? always!! matter of fact I will right now!! Keep on blogging! You have great content. It’s not easy being self motivated!! Thank you so much! appreciate your support and kind words!